KRLA’s man on the move, Jed, takes us inside the workspace of FatCaps Series 3 artist, KaNO, in this fresh installment of Studio Snaps. Renegade spray paint cans are primed to bomb the streets, November, with this new blind box mini series from mastermind artist MAD featuring kaNO, Marka27, Jesse Hernandez, Scribe, Pon, Brunson and Sket One. Hometown vinyl hustlers, Myplasticheart is pulling out all the stops this year for New York Comic Con with a ton of exclusives, pre-releases, customs and signings going down at their booth 879. Last Thursday, kaNO was throwing down at Kidrobot Los Angeles for a live painting of a MEGA MUNNY. Awesomeness ensued! 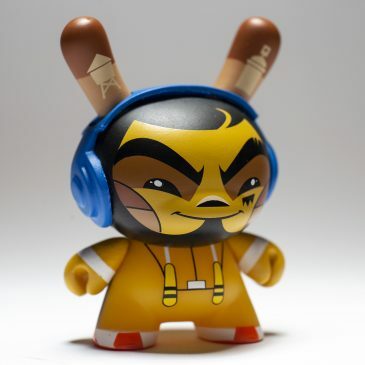 Kidrobot Los Angeles will be rocking out this Thursday, April 14 as kaNO will be in the house for a live painting of a MEGA MUNNY. Get a load of these 3 rockin’ 20-inch custom Dunnys for the Gibson Guitar’s charity art exhibition, Art Assault. Follow these people on Twitter, @noferin @shopatama @crisr and @kaNO because it’s Friday and they’re awesome! Check out myplasticheart’s New Moon: Interpretations of the Chinese Zodiac 2010 show, featuring the likes of kaNO, Lou Pimentel, Yumiko Kayukawa, Ken Keirns, Griselda Sastrawinata, Mary Louise Silva and others.